That is all that she said. At least, that is all that is recorded for us. She did not ask Jesus to do anything. She simply pointed out to her son the fact that the host had run out of wine. 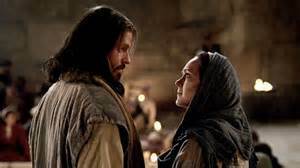 Mary speaks to her now 30-year old son as if she knows that Jesus could rectify the problem, but we do not know how she thought that he might fix things. It would be interesting to know more about the growing up years of Jesus, but the fact is, we simply do not know. There are some apocryphal books that tell of some incidents of Jesus' childhood years, a few where he did some kind of miraculous act, but these stories are not necessarily factual. Every famous person in history has had stories written about them that someone made up afterwards and then tried to pass off as fact, and Jesus was no different in this regard. Many people wrote many things about him, and many inaccurate things. But even if Mary had never before seen Jesus do anything resembling a miracle, she did know that Jesus was the Messiah, and that he undoubtedly could do great things. Even if Jesus had never performed a miracle up to that point, Mary had confidence that he could do something – she did not know what. We often hear that this was the first miracle that Jesus performed, but this is a good place to bring up a theme that runs throughout the Gospel of John. Notice that John does not actually call what Jesus did as a miracle. He called it a sign. There is a significant difference between these two terms. What John calls a “sign” in his writings is a miracle, but it is a miracle that carried an additional significance. Just like the sign out on the road that tells passers-by that this church is called “The Log Church,” the signs in John’s gospel are miracles that Jesus did that demonstrated to those who saw them that he was the Christ, the Messiah. This first miracle turned out to be a sign. It was not like the other miracles of Jesus where he healed the lame and sick, or where he fed the hungry. This miracle did not carry that kind of “humanitarian” significance. Nevertheless, this first miracle, as unlikely as it may have been, turned out to be a sign. I do not think that many people at the wedding noticed that it was a sign, but the disciples did. John writes that the miracle “manifested His glory, and His disciples believed in Him.” It was something that indicated to the disciples that this man whom they were following was indeed the Messiah. As I mentioned earlier, the problem of running out of wine at a wedding was no small problem, not when the entire village is present. A small bottle of wine will not do. I am not sure what happened to the original containers for the wine, but for some reason, Jesus did not want to use these. Instead, he elected to use six stone water pots, which were normally used for the custom of purification. Each of these had a capacity of twenty or thirty gallons. So you do not need to do the math, I will. The total capacity of all these pots together was 120 to 180 gallons! That is like three of those large 55 gallon barrels that are so widely used in manufacturing today. The great volume of wine needed suggests the great number of guests and the great problem that the host faced. I am going to put some significance into the fact that the original purpose of these stone water pots was that they were to be used for the Jewish custom of purification. They were made for that purpose and it was for that they were used. These were not every-day pots used for whatever the need happened to be. They were purification pots. The Jewish customs of purification involved a spiritual cleansing at least as much as a physical cleansing. The custom spoke of a cleansing of one’s soul as well as the cleansing of one’s body. It was these containers that were used for the cleansing ceremony, which Jesus decided to use for turning the water into wine. The reason that he decided to use these pots may have been quite simple. Perhaps they were the only ones available that had the volume necessary to make enough wine. 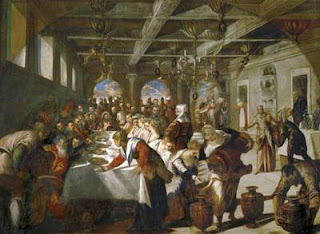 Nevertheless, the fact that the host had run out of wine suggests that there had been wine before. That wine certainly had also been stored in containers of some kind. Why did Jesus not use these, now empty, containers? As I said, the reason may have been quite obvious if we had been there, but I am going to put myself out on a limb a little and suggest a connection between the cleansing purpose of the containers and the celebratory aspect of the wine. Last week I spoke of John’s baptism, which was a baptism of repentance. Repentance, by its very nature, involves sorrow. In repentance, we become sorry for what we have done. John’s baptism of repentance involves the image of going down into the water with your sins clinging to you, and emerging out from the water cleansed of all of it. In that way, it is much like the ceremonial water pots that were at the wedding in Cana on that day. That ceremony also alluded to the cleansing of one’s soul. We know that John’s baptism of repentance did not literally wash the sins off of one’s body, like washing off the dust of the day. Similarly, the Jewish ceremonial washings did not literally wash the soul of a person. It was the imagery that was important. In a similar way, the imagery of Jesus using the ceremonial water pots to turn the water into wine is significant. Here, Jesus is demonstrating celebration. Sorrow for wrongs done is important in the Christian life, but this is not to be the continual pattern for a Christian life. The true pattern for a Christian life is one of celebration. Many people look at the Christian life as one where a person is constantly condemning himself or herself for their imperfect actions. Even many Christians look at their lives in this way. We think that we should never be happy with our lives. The Apostle Paul wrote about this very tendency in the book of Romans, chapter 7. He writes how he had the great desire to obey the law of God, but there was something like a war going on within him. There was not only the part of him that wanted to obey God, but also a part of him that wanted to disobey. He could not seem to shake it. That is how many Christians often feel: Wretched. Wretched. Wretched! They constantly bemoan the fact that they still have struggles. Paul continues in his writing by recognizing that this inner battle still raged within him. He still had struggles, but then he says these words that you should place in your memory files: “There is now no condemnation for those who are in Christ Jesus. For the law of the Spirit of life in Christ Jesus has set you free from the law of sin and of death” (Romans 8:1-2 NAS). Full victory will eventually come to us, not by our own actions, but through Jesus! If that is not a reason to celebrate, then I do not know what is. Pour a glass of celebratory wine! Jesus told the servants, those whom his mother had ordered to do what he said, to fill the purification water pots. They did what he said. They filled them to the brim. Again, they did what he said. When the servants brought it to the headwaiter, he thought that he had better taste it first. He did not know where it came from, and wanted to be sure that it was good wine. Such fine quality was it, that with that first taste, he had to call the bridegroom to come to him, despite the fact that the bridegroom undoubtedly had other things to do to. I am using this story in an allegorical sense. It does not mean that I think that the entire account is an allegory, for John is telling it as an actual occurrence. It was the beginning of the signs that exhibited the glory of Jesus the Messiah. If you are a believer in Jesus Christ as the one who has saved you from who you are in your natural state, and if you are one who has declared that he is your Master and Lord, you have reason to celebrate.